Become a Bradman Experience Ambassador! | The International Cricket Hall of Fame. 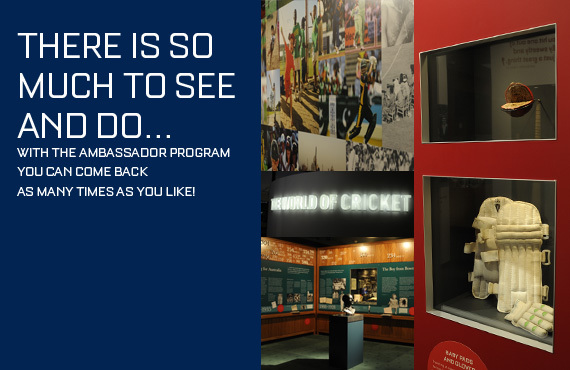 Home » What's on » Become a Bradman Experience Ambassador! The International Cricket Hall of Fame is delighted to announce that it’s Bradman Experience Ambassador program, launched in late December 2011 has been warmly received by residents of the Wingecarribee Shire! Residents of the Wingecarribee Shire (postcodes 2575, 2576 & 2577) benefit with unlimited museum entry for a period of one calendar year after the purchase of admission. This means that you only have to pay once a year and you will receive unlimited entry into The International Cricket Hall of Fame! Designed to work in conjunction with the ‘My Southern Highlands’ program, the Ambassador program is all about recognising the important role that the local community plays in supporting and promoting the museum to their visiting friends and relatives. Free membership to the Bradman Foundation is also included and a free upgrade from a standard to a large coffee can be obtained anytime an Ambassador presents their card at Stumps Cafe. For more information on becoming a Bradman Experience Ambassador either call us on 02 4862 1247 or just ask at the reception.